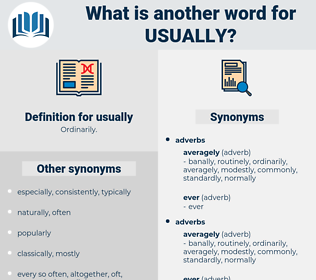 What is another word for usually? ordinarily, habitually, customarily, generally, normally, typically. 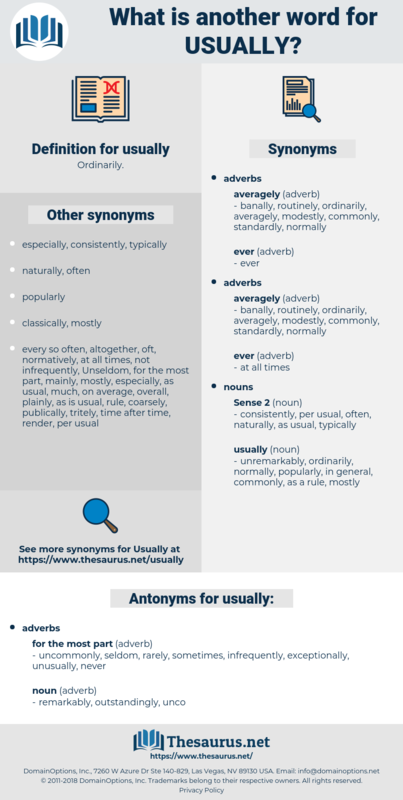 often, traditionally, frequently, routinely, always, regularly, largely, conventionally, invariably, rarely, sometimes, otherwise, primarily, popularly, universally, generically, unusually, predominantly, consistently, essentially, currently, basically, necessarily, constantly, infrequently, principally, naturally, globally, characteristically, readily, simply, actually, seldom, rather, reasonably, almost. Recurring, targeting, being, Creating, bringing, speaking, Doing. uncommonly, seldom, rarely, sometimes, infrequently, exceptionally, unusually, never. He went at the time at which he was usually in his office. You'll know what to do, if you haven't done it already; girls usually have, when they want advice.